It was an early start for Gill and I on the Monday morning – so early that there wasn’t any traffic on the M42! We found ourselves queueing to check in behind the entire Shrewsbury Town football club (players, not supporters, he added hastily, in case they actually have supporters) – although once a few more check-in desks opened up, things moved quite quickly… giving us plenty of time for a coffee before the quick hop across to AMS… for a short layover during which we found the entire Luxembourg contingent waiting for the same flight to KIX. That was a long flight, with virtually no sleep, shortened a bit by a David Baldacci novel that was really cheap on the Kindle. It passed the time. At Kansai International the puzzlers reassembled in the immigration queue before collecting our bags and heading for the Limousine Bus to Kyoto, where René stopped Gill and I from insisting on getting off the bus stop before the one right outside our hotel. We arrived too early to check in so Gill and I settled down in the hotel bar for a couple of hours over rosbif sandwiches and a couple of drinks while we watched some delighted little schoolkids being taught to make mocktails by the hotel bar staff for their parents and teachers… much happiness, even if there wasn’t much alcohol for the big people! They temporarily give up on their mission and we head off to the station in search of some dinner – there are a lot of restaurants at the station! We find a great little place and have a terrific meal of Yakisoba and kebabs. Back at the hotel we find Pat Major with a Martini and a Club Sandwich so we join him and catch up for a while before we feel the need to crash somewhere around 10pm… that goes well until 4am when Gill and I are wide awake and reading our books. We had slightly more luck looking for the next one – it wasn’t where it was supposed to be – it had moved, so someone helpfully pointed us in the right direction… sort of. We got to within about a block of where we thought it was, but couldn’t find it so we asked a lovely old lady at a bus stop – she recognised the name immediately and insisted on taking us to the shop herself – not sure if she actually caught her bus after that! 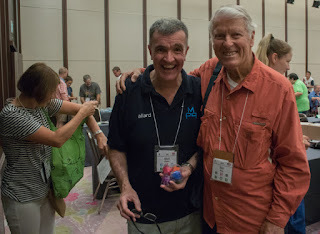 We didn’t feel too bad about missing it – we’d walked right past it – as it was on the 2nd floor and the only sign of its presence on the ground outside was a name in the lobby in Katakana – something neither Gill or I have mastered yet! It turns out to be an Aladdin’s cave of crafty stuff… good find! From there we ducked into a department store that happened to have a craft, fabric and fibre store in the basement – Gill’s delighted, and when we head up to the toy department, I’m delighted to find a small selection of puzzles, including an almost complete selection of Hanayamas so I pick up a copy of Cast Diamond and Cast Cake. We have a couple of dark chocolate iced mochas at Starbucks (this became a bit of a theme given the temperatures and the humidity while we were there) before heading across to the Kyoto Cycle Project to meet Hideaki. He’s our tour guide for the afternoon and takes us on a wonderful tour around the back streets of Kyoto, along the canals & river, taking in a couple of the geisha quarters and the Imperial Palace. Interesting to see a smart mini-bus disgorging a load of smartly-dressed businessmen in the centre of the geisha district while several impossibly doll-like maiko clip-clop between their tea-houses and the school building. 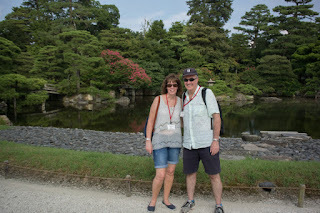 We cycled up and down the banks of the Kamo River with a lightning tour of the Imperial Palace in between, before getting absolutely drenched in a downpour about half a mile from the cycle shop at the end of the tour. Sod’s Law! We grab a sandwich and a coffee in the mall before heading back to the hotel and formally registering for IPP36 – badges around our necks it starts to feel like IPP has begun. Dinner for the two of us is at a restaurant across the road from the hotel… and after a quiet dinner we realise there’s a large table-full of puzzlers at the other end of the restaurant so we wander over and find Nigel and Steve and a bunch of other friends we haven’t seen in ages (or a couple of weeks!). When everyone’s finished their dinner we head back to the hotel and pretty much take over the lobby area. 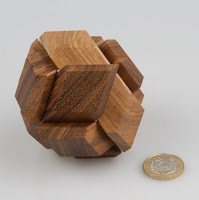 There are even more puzzlers there to catch up with and I find myself alternately thrusting puzzles at others and having puzzles thrust at me… by far the one that gives me most pleasure is a new design from Ken Irvine called Lil’ Bruce (named after his second grandson). Four pieces make it absolutely clear exactly where they need to go, you just can’t get them to actually go there… brilliant puzzle. We chat and puzzle and drink in the lobby until we’re exhausted and then crash… it’s been a year since we’ve seen some of these guys – it has to be done! 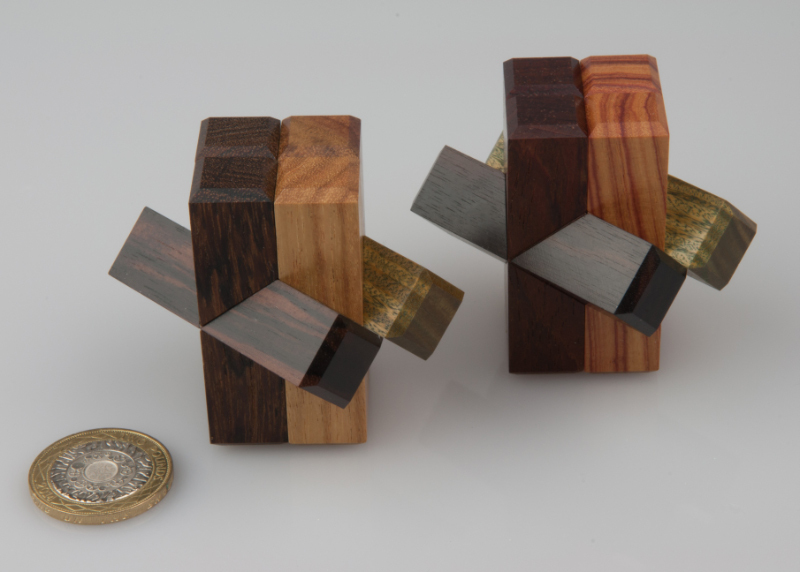 A few months ago I treated myself to a pair of puzzles from Lee Krasnow: a matching set of a Diagonal Burr and Coffin’s Pseudo-Notched Sticks… I’d loved the idea of getting a pair of these to have lying around to demonstrate to non-puzzlers that what-you-see isn’t necessarily what-you-get with puzzles – in fact sometimes those darn puzzle designers try and use that against you. 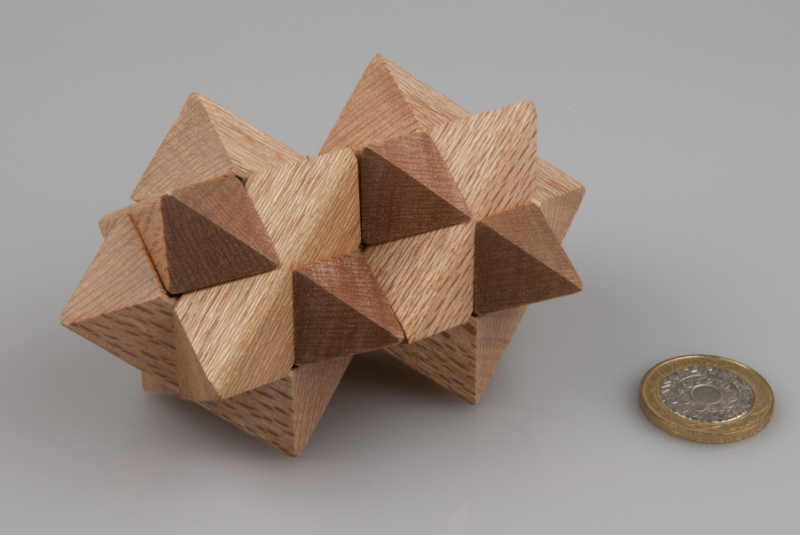 The standard diagonal burr is made up of six identically notched sticks that slot together in a standard six-piece burr shape except that the sticks are all on the diagonal instead of being flat against one another… pulling any set of adjacent pieces apart will almost instantly reduce the assembled puzzle back to the pile of pieces it started out as – and assembly is only slightly tricky as it needs to be built in two sub-assemblies that are offered up at the end. Pseudo-Notched Sticks is another animal altogether – designed to look exactly like its simpler brother (aka ole Notched Sticks) when it’s assembled, there is no hint of familial resemblance when looking at the unassembled pieces… and indeed the standard approach of gripping adjacent pieces and pulling them apart sideways won’t help you disassembling this guy at all, in fact you’ll be pulling against yourself all the way! 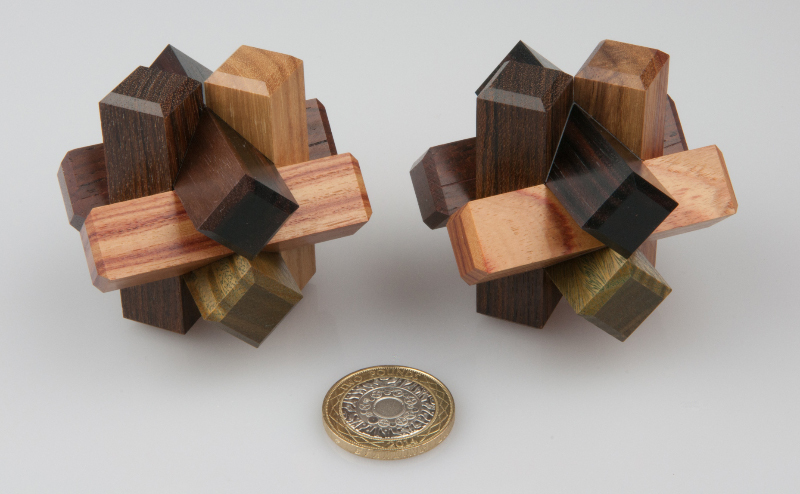 Lee’s set comes beautifully presented in his customised boxes, with woods neatly matched between the two puzzles so that they actually look pretty darn similar when they’re assembled next to each other. As you might expect with Lee, though, the matching goes a lot deeper than just choosing bits of similar wood… while the standard diagonal burr is normally made of single sticks with notches cut in them (can you tell where the name comes from yet?!) 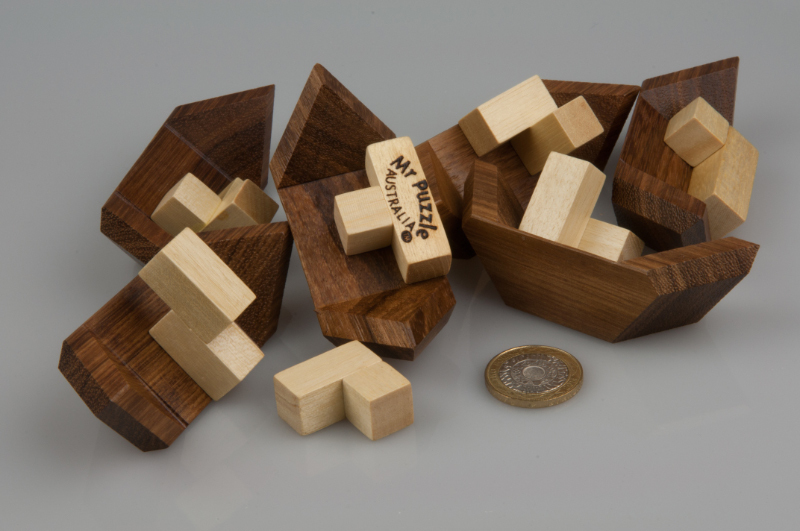 Lee’s copies have the sticks made up of three separate pieces, so that when you examine the two puzzles next to each other there’s no visual clue as to which of the sets is Pseudo and which isn’t… a thoroughly bonkers attention to detail that deserves calling out! 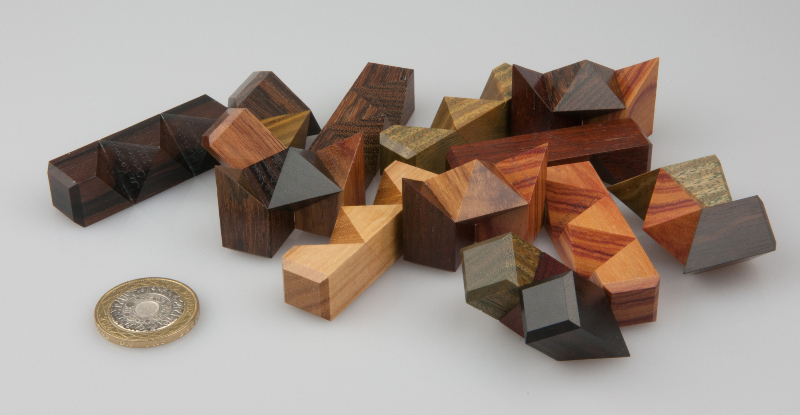 One of the little delights of having a perfectly made set of matching pieces is the ability to put together some Franken-puzzles combining bits of both sets – and still producing a set of matching puzzles… neat, eh? First up is a Stuart Gee design called Diagonal Twins that mates a pair of Diagonal Burrs along a shared axis – although you’ll need to think about the axis a little… a few of the pieces are a little unusual but most of them are your standard common-or-garden notched sticks… the number of non-standard sticks gives a pretty good clue to how they’re going to be used, but I still found I needed to think things through to find the appropriate assembly. Brian Young’s Insoma Burr takes things to an all new level of complexity, however. On the outside it might look a bit like a stylised diagonal burr, and it certainly comes apart like a diagonal burr, the insides are nothing like a standard diagonal burr… each of the main pieces has a piece of a Soma Cube attached to its centre, with the final piece (because a Soma cube has seven pieces) free to be placed in an appropriate place. This is, I believe, the first guest piece on Allard’s brilliant blog. So I feel special and I also have something quite special to talk about. By way of introduction, I’m Gerard, a puzzle collector (mainly puzzle boxes though I tend to stray into buying other puzzles on occasions - much to the distress of my credit card! 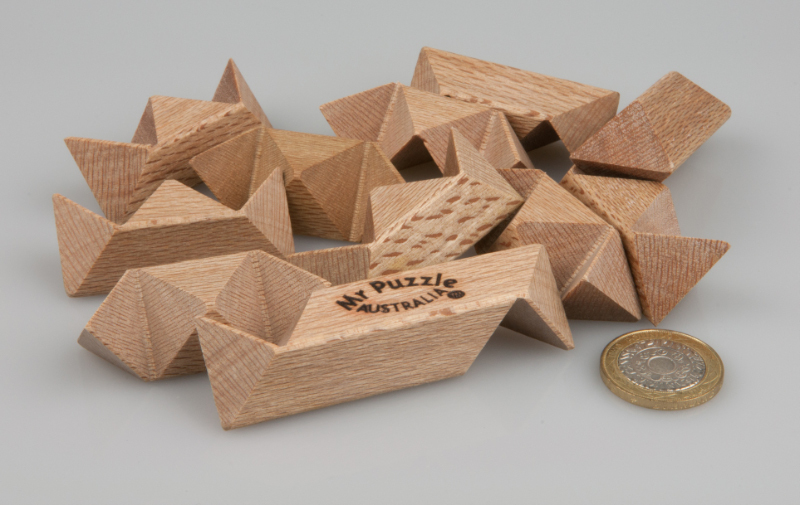 ), and I often use puzzles in creative thinking workshops which I deliver. You can hear more about these workshops if you’re interested here. First up, a bit of expectation management. The puzzle I’m about to describe is not available to purchase and was made strictly as a one-off. It will never be for sale as I’m never going to part with it. Given that it’s a one-off, there are a few spoilers below. It was a gift made by Shane Hales, a relatively new burgeoning talent on the puzzle-making scene. Shane made it as a one-off and the look, approach and ideas were all his. Some more expectation management before we go on – I’m afraid that Shane doesn’t do commissions as he also has a full time job. When Shane dropped me a line to say that the box was ready, to say I was pretty excited is a complete underestimate as I had heard rumours on the puzzle circuit that a lot of thought had gone into the box and Shane had teased a few people with some of his ideas. I had no real idea what to expect though was envisaging a typical small wooden puzzle box. We met in a café and following some pleasantries he passed over a large, beautiful, heavy, wooden box with an intriguing design. On the front was a locked hinged door with the words “Fairies keep out” scratched onto it. The waitress in the café saw it and immediately said “Wow, that is so beautiful”. The people opposite us in the café stopped talking and stared both curiously and impressively at the box. I was so taken aback by the box that I didn’t immediately twig that it had been made to complement Mike Toulouzas’ Fairy Door puzzle box. It was made with Mike’s blessing and has a bit of a ‘goblin’ feel about the design which makes it fun. Shane had the initial idea from the film ‘Beetlejuice’ a few years ago and then with Mike releasing the Fairy’s Door in 2015 it gave Shane the inspiration for the Goblin’s Door. What was immediately very apparent was there was a huge amount of work put into the box and its creation and so I decided to take my time with it and spent the next few weeks exploring it, playing with it but mostly admiring it. In essence, it is a sequential discovery box combined with a few secret compartments and treasure to be discovered. All the things that I love about puzzle boxes brought into one. The other thing I love to have is a solution. Ok, I know there are some members of the puzzle community out there reading this and putting me into the ‘feeble’ category of puzzle solving. That may be close to the truth but I have in the past broken bits of puzzles by forcing pieces that shouldn’t be forced or not solved them because whilst I thought that something needs to be yanked, I was just too afraid to do it in case it shouldn’t be and I end up breaking a piece. Shane obliged my request but rather than some hints written on a scrap of paper as I was expecting, he put together a comprehensive colour booklet giving step-by-step solutions with photographs to opening the Goblin’s Door. So whilst I might have a hunch that perhaps something pulls up or could be moved, before doing so I can check that I’m on the right lines and so avoiding potentially damaging anything. It meant that I could really enjoy the box and explore it with ease. After some searching on the outside of the box, pretty soon I found some tools (though they were cleverly hidden) and then the first challenge – using them to pick a lock. There’s a sense of achievement in getting through this stage and opening the door – particularly if, like me, you’ve never picked a lock before (honest). But of course having got the door open, I realised it only opens so far with a chain preventing it and a creepy hand poking out (yes really!) to warn you of what lies within. So, another challenge to overcome – open the door fully – if you dare. Once inside there is what I guess you might expect to find in a goblin’s home – an assortment of ghoulish items hanging up including a whip, a head of a goblin and oh, something that looks like a key – might be handy - need to get it but it’s screwed to the wall so must search for another tool. Each tool found has only one use and the steps are intuitive with one thing leading logically and creatively on to another. More tools then need to be discovered as you explore the box, a mouse needs to be rescued, and the goblin’s hiding place revealed. 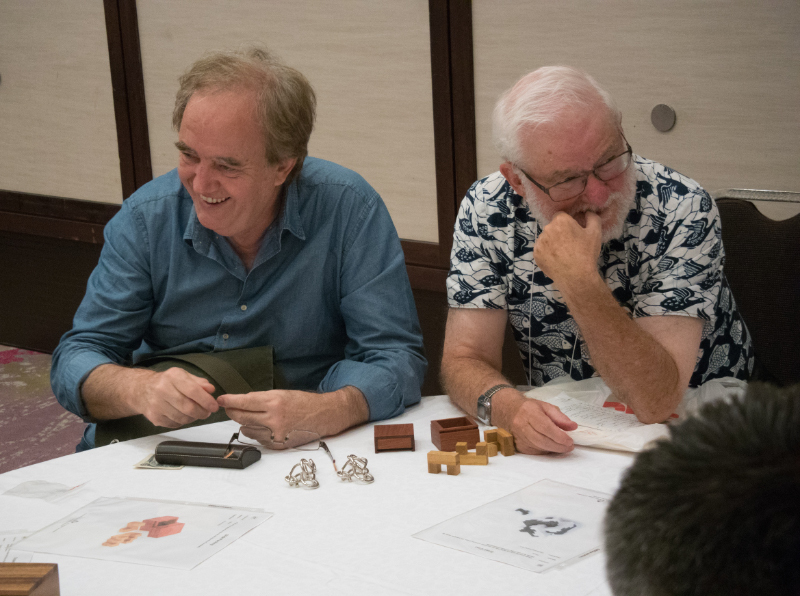 Following a series of fun moves a back wall falls apart to reveal two excellent puzzles to play with: Robert Yarger’s Pirates Wallet Lock (very clever) and Luke Vandear’s Silver Eagle coin puzzle. I’ve never come across the latter before but suffice it to say it is amazing – a coin broken into tiny fragments of pieces that need to be put together like a jigsaw. Certainly something not to be done with bear hands. The Goblin’s Door is a fun, highly enjoyable puzzling journey with lots of ‘aha’ moments and feelings of intrigue, achievement and discovery. It is also a beautiful piece of craftsmanship. It’s truly wonderful. My favourite aspects? Well the lock picking was especially fun (but rest assured I don’t think I will abandon the day job for a career in cracking safes just yet), the fact that getting the door open is only half the journey, and finding a mouse under some floor boards put a smile on my face. Congratulations to Shane on a brilliant puzzle box and thanks Allard for letting me have this first guest review.